If you own a vintage Honda, you enjoy one of the best machines ever engineered. You also get to enjoy a 40 year old wiring harness! The wires in the harness last indefinitely. Not so, for the connectors and plugs. When the magic smoke disappears, your day is ruined! 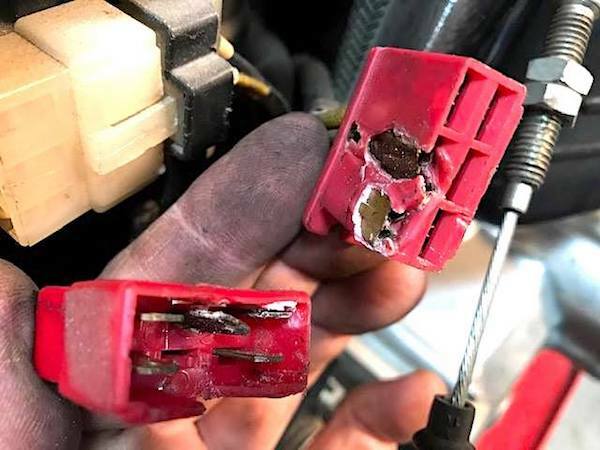 Often a deteriorated connector plug is the culprit. In the photo above, Randy found evidence for all these factors. High-load stator and alternator connectors seem to fare worst of all. You’ll see advice on forums to cut out the connector and simply solder the wires together. Don’t do it! This will work in an emergency, but there are problems. First, the skill required for a successful high-load soldered connection is considerable. Worse, all future mechanics who come behind your work will curse you! 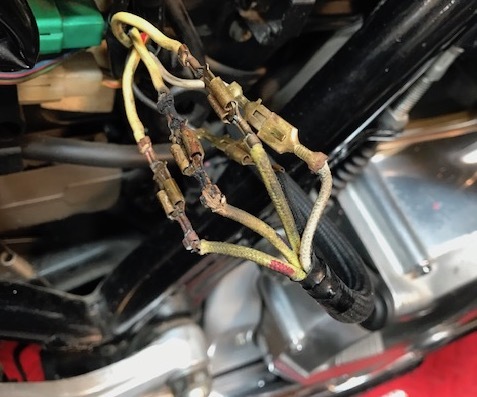 Trust me – nothing is worse than working on a bike with a butchered wiring harness! Don’t do it. Best solution is to source new connectors and terminal pins from this excellent source: Vintage Connections. 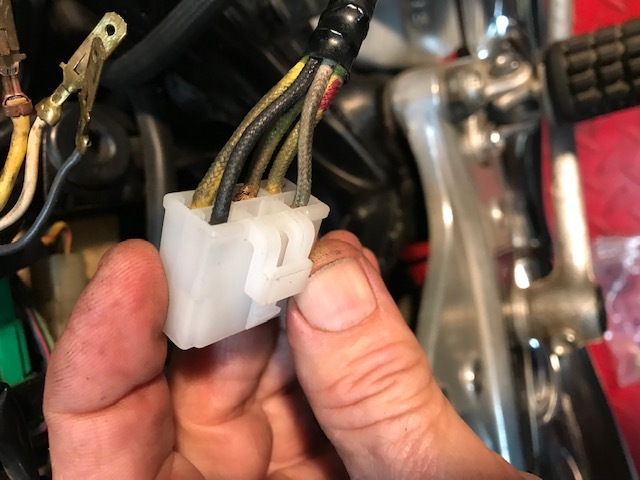 This reliable resource is my “go-to” expert for OEM Style Japanese Motorcycle Wiring Terminals and Connectors that correctly match factory installed components. Why “butcher” when you can do the job correctly! 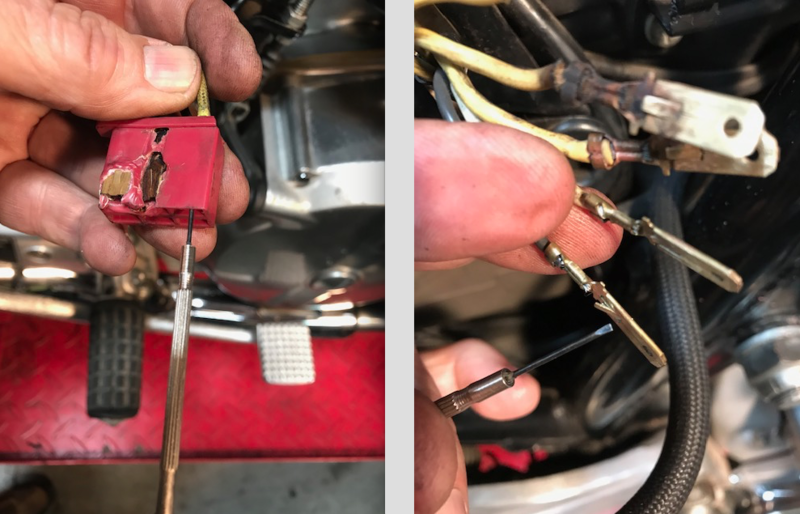 Vintage Connections was founded by Del Gundlach when he found that there was a severe shortage in the market for vintage Japanese motorcycle terminals and connectors. 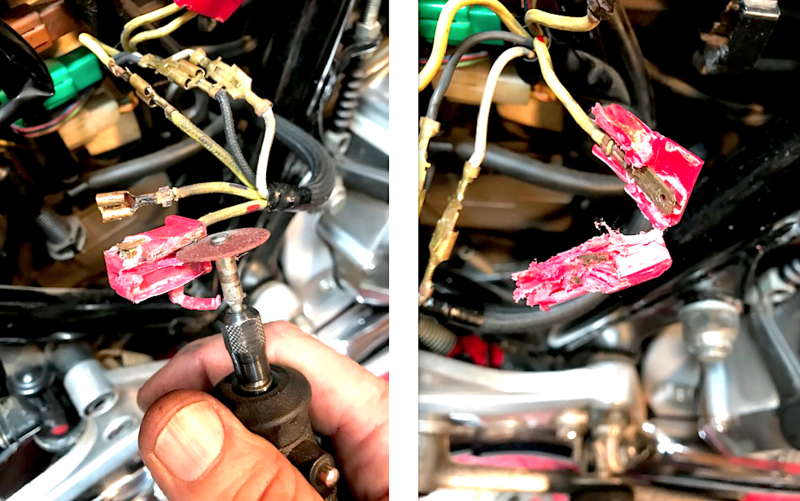 When it came time to wire up his old Honda CB350, the parts just couldn’t be found on American shores. So he figured out the sourcing puzzle and founded a very successful business. Sound familiar? 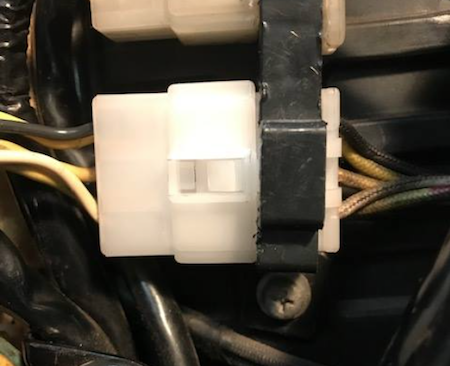 In most cases, the wires themselves are usually fine …just replacing the connector block is all you need for a no-compromise fix. The correct terminals usually come with each replacement block, so those are easy to swap out as well. 1. Make notes / mark both sides of all wires entering the old block as necessary so they can be matched up properly. It’s helpful to snap a few photos to make sure you duplicate the factory orientation of all wires into the new block. 2. You’ll need an extractor tool to release the terminals from the old connector blocks. Without an extractor, you will be severely frustrated by the “one-way” terminal barbs! Vintage Connections sells a nice set in the commonly needed sizes. In a pinch, a suitably-sized micro screwdriver will also release the terminal barbs. Extracting Terminal Pins Using Micro Screwdriver – Note Terminal Barbs! 4. 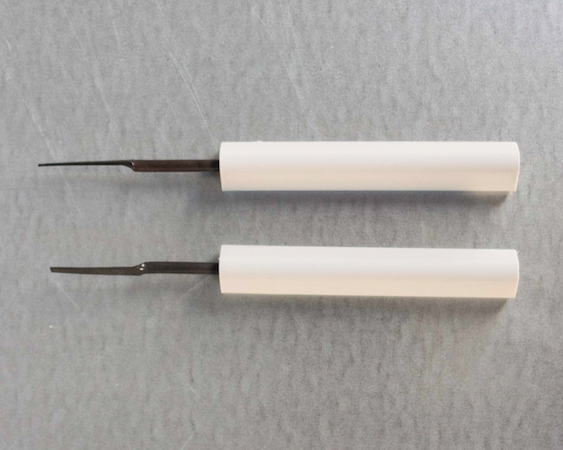 If the terminals need replacement, use the correct tool to make a secure double crimp. Do not use solder! Vintage Connections sells the correct tool to do a factory style double crimp. When done correctly, there should be a crimp on the bare wire + plus a stress-relief crimp on the outer insulation. 5. Simply push the terminals into the new block taking note of the “recess”for the one-way barbs. 7. Sometimes, if there are too many problems you may have to face the inevitable. Replacing the entire wiring harness may the best option. 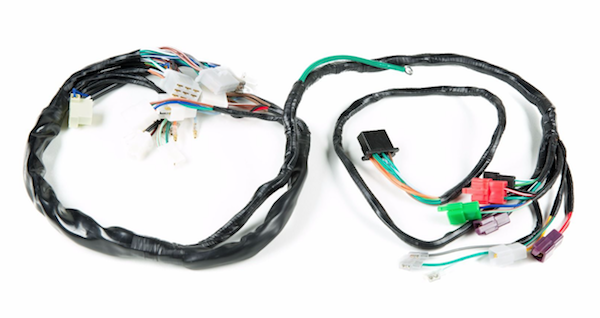 Fortunately, excellent reproduction wiring harnesses are more available than ever. The best cure is always prevention by periodically opening the connector blocks, cleaning the terminals and applying a dielectric grease. This repels moisture and protects electrical connections against corrosion. Residential electricians use a copper impregnated conductivity paste that some recommend for this application. That’s a good product, but I don’t recommend it because it can “travel” when hot and cause short circuits. Why no solder when fitting a new terminal? Just a small dab so it won’t interfere when entering the new block.